Guests looking for a country hotel in Durban will find the ambiance of Audacia Manor provides peace and tranquillity on the edge of the city. Audacia Manor is a gracious country lodge hotel in Durban offering fine facilities, gourmet cuisine, banqueting, and conference facilities for the discerning guest. This elegant historical building provides a delightful home from home with all amenities on hand. Each of the en-suite rooms has a unique character. 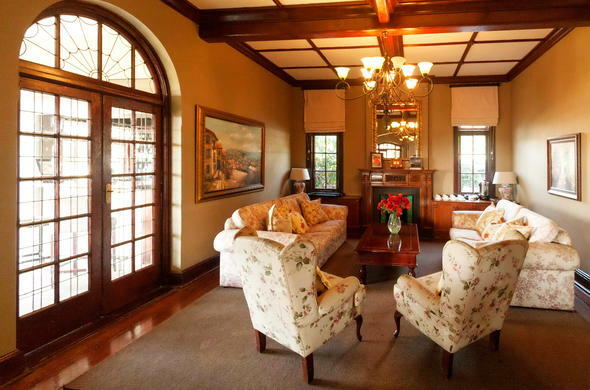 This country lodge hotel in Durban exudes good taste and genteel charm. Guests can relax in comfort in their suite or in various sumptuous spots around the house. The Cocktail Bar is the ideal place for sundowners and ocean views. Audacia Manor serves delectable meals and wines wherever guests feel comfortable. For relaxed enjoyment and cocktails, the bar in the Coach House is located near the sparkling swimming pool and enjoys views of the gardens and sea. Croquet and boules enthusiasts can have a game on the lawns and later take tea on the shady veranda. A good read can be found in Audacia Manor's dining room which is lined with books. This country lodge hotel in Durban can host special functions or a business conference with exclusive use of the house, for up to 40 delegates in attractive and flexible surroundings. Extensive menu options are offered including Halaal and Kosher meals. High-tech facilities include TV, video and video projectors, there is also a full secretarial service available.